The Forklift Reader can sense its environment and autonomously manage the complete pick, drop and stack operations while providing store and forward transactions directly to the cloud via Wi-Fi or optional Cellular communications. 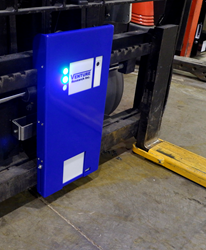 Today, Venture Research, Inc., a leading global supplier of RFID and IoT solutions has announced the next generation of Industrial Forklift Readers. The Venture Research solution is designed from the ground up to withstand both indoor and outdoor harsh environments of forklift usage with its IP65 rating while incorporating the state of the art in RFID and IoT technology. With the swappable rechargeable Li-ion battery, the reader can be quickly installed to full operation in just 5 minutes on a standard type 2 or type 3 carriage forklift. An extensive array of options including support of up to 8 additional antennas, front-facing camera, Vehicle Mount Terminal (VMT) support, GPIO, CAN Bus interfacing and flexible power options round out the extensive built-in features.